Though Bill Musselman’s career has been checkered with controversy, his achievements have been many, both as a player and coach. Musselman grew up in Wooster and was a three-sport standout in high school from 1954-58. In baseball, he was a catcher, and on the basketball courts a high-scoring guard, but some thought his best sport was football, where his hard-nosed attitude fitted in well. As an athlete, he spent hours practicing alone, working endlessly on his weaknesses. Musselman enrolled at Wittenberg to play both football and basketball, but rarely got a chance to play. It was at Wittenberg, though that he started honing his coaching skills, learning from the Tiger mentors. From Wittenberg, Musselman spent a year as graduate assistant at Kent State, before taking the high school head coaching position at Kent State University High. From KSU High, where he was 14-5, Musselman went to Ashland College, spending a year as an assistant before being named head coach at the young age of 25. At Ashland, Musselman built a small college basketball dynasty. He drilled mental toughness into his players, and based his attack on big players and defense. The Eagles were always one of the top defensive teams in the nation. In six years at Ashland, Musselman recorded a 129-30 record before moving to Minnesota. In his first year as Gopher coach (1971-72), Musselman guided Minnesota to the Big 10 championship and an NIT bid with an 18-7 record. The following year Minnesota was 21-5. In four years at Minnesota, Musselman’s teams won 69 games and lost 32. Musselman then spent parts of seasons with money strapped American Basketball Association franchises San Diego and Virginia. In 1978-79, Musselman coached the Reno Big Horns of the Western Basketball Association to a second play finish, and in 1980, was named head coach of the Cleveland Cavaliers. 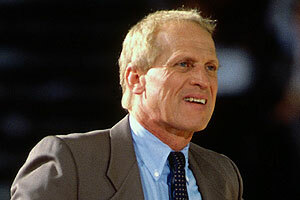 Later that season Musselman was relieved of his coaching duties and named Director of Player Personnel for the Cavs. And just this year, Musselman was reinstated as the Cavalier coach. Though Musselman’s coaching career has been up and down and marked by some unfortunate incidents, he has always dedicated his life to athletics. His accomplishments stand alone in Wayne County history.